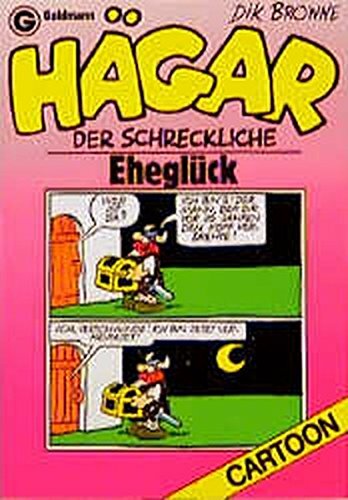 Hägar der Schreckliche. Eheglück. (Bd. 11). ( Cartoon). by Dik Browne | Graphic Novels | This book has not been rated. Don't panic! In clearing up the database, we came across this book you tried to register a while back when our server was acting up. This BCID got hidden away in cyberspace and might not be associated correctly with the book you see listed here. Or, you may have realized that the BCID didn't show up on your shelf and re-registered the book. Either way, we wanted you to be able to track the book should it ever check in again, so we've re-added it to your shelf. If you know that this BCID is out in the world in a copy of the book, you don't have to do a thing-- just smile and wait for the book to write home. If you know that you re-registered this title with a different BCID (because of an error from our server when you were trying to register the book) then feel free to recycle this BCID by clicking on the edit book details link and re-assigning it to another book. Hello and congratulations! You have not only found yourself a good book, but a whole community of booklovers dedicated to sharing books with each other and the world at large. I hope you'll stick around a bit and get to know BookCrossing --maybe even make a journal entry on this book. You may choose to remain anonymous or to join (it's free!). Feel free to read and keep this book, or to pass it on to a friend or even set it free "in the wild" for someone else to find as you did. If you do choose to join and journal, then you can watch the book as it travels - you'll be alerted by email each time someone makes another journal entry. It's all confidential (you're known only by your screen name and no one is ever given your email address), free, and spam-free. Happy reading!